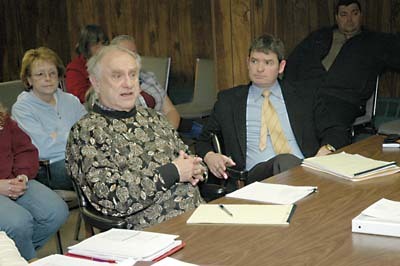 Liberty town justices Harold Bauman (left, who is also the village justice) and Brian Rourke discuss court matters with the town board last week. LIBERTY  The Village of Liberty Court has a few more days of official existence left, but its absorption into the Town of Liberty Court has already begun. And one village court clerk won’t be transferring from the village hall across North Main to the town hall. Nevertheless, he was in agreement that the town could currently only afford to hire the senior village court clerk, Lillian Rubio, albeit as a new employee. That means she’ll be making nearly $2,000 less than before  from $33,500 a year at the village court to $31,655 at the town court, according to Town Director of Financial Services Earl Bertsch. Plus Rubio will have to contribute 10 percent to her health insurance premium once the insurance kicks in after a six-month waiting period. And her years of service with the village will count for naught with the town. But Rubio at least will still be employed. Come next week, Deputy Village Court Clerk Vicki Winchester will be out of a job. Winchester confirmed yesterday she is upset  but not with the town board. Instead, she blames Mayor Richard Winters, whom she feels misled taxpayers into thinking there will be savings for the village, even though village taxpayers like herself are also town taxpayers. Proud of her hard work to ensure fine collections and create payment plans, Winchester will end her three years with the village court by trying to coordinate some of that last-minute hecticness, but she’s not seen any job offerings that will stave off collecting unemployment. “So I’m screwed,” she remarked matter-of-factly. Outgoing Village Justice Harold Bauman, who is also a town justice, advocated for hiring both village clerks, noting that the town may become one of the three busiest municipal courts in the state. But town officials only indicated Winchester could be hired down the road, once the economics of the situation are better known. “Once the dust settles and if the judges feel we need to make more changes, then we’ll take those things under consideration,” said Town Councilwoman Lynn Killian. Bertsch said the town board was also worried about the fact that the judges are only legally able to appoint up to four clerks (two apiece), and Winchester would have been the town’s fifth. That would make the position a Civil Service job, and while she could be hired on a probationary term of three months, if she failed to place in the top three on the Civil Service exam, the town would have to let her go  and swallow the unemployment coverage costs, rather than the village. “We weren’t [fiscally] ready to hire [another clerk],” Bertsch explained, who wished the town had had more time to plan. He’s also not sure if the township is ready to take on the village’s court system, but that choice has already been made by voters. • Criminal cases will be handled in the village’s courtroom, which can be opened for arraignments 24/7 and has four holding cells. Civil cases (i.e., vehicle and traffic tickets) will be addressed in the town’s courtroom. The town will be charged by the village for use of the village courtroom, including rent, utilities and the security services of police officers. Bertsch said the amounts are still being worked out. • The NYS Office of Court Administration is taking inventory and will help determine what furniture and equipment remains in the village hall and what gets transferred over, but all the court clerks and the judges’ chambers will be housed in the town hall, which will see the addition of phone, electric and data lines to compensate. • The computer systems for each court are incompatible; therefore, records will be maintained on both until cases are closed and the clerks can input village court records into the town’s system. • Notices have been sent and signs will be posted to direct people to the proper courtrooms and offices. Police Chief Rob Mir dryly noted that all the village’s parking tickets will have to be replaced or given a sticker overlaying the address of the village court with that of the town court. • The judges will be responsible for coordinating staff, schedules and cases. Councilman Austin saw, too, a chance for the town and village boards to work more closely. “It’s the Village and the Town of Liberty, but it’s a community of one,” he stated. “We couldn’t agree with you more,” replied Village Councilwoman Corinne McGuire, who with Councilwoman Joan Stoddard met with Austin and other town officials last Thursday.